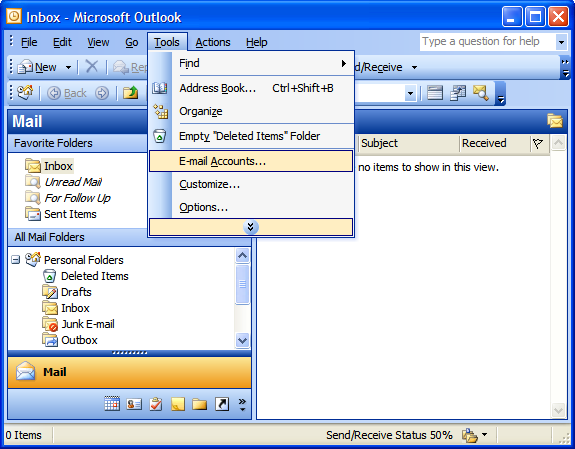 Step 1: In Microsoft Outlook, select “Tools” > “E-mail Accounts”. 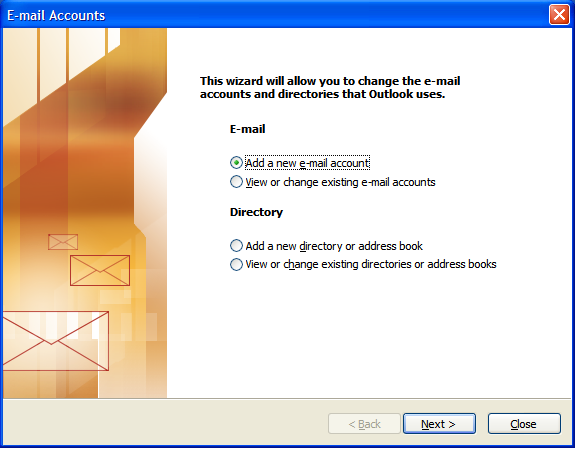 Step 2: On the E-mail Accounts wizard window, select “Add a new e-mail account” and click “Next”. Step 3: For your server type, select “POP3” and click Next. “Your Name”: Enter your first and last name. “E-mail Address”: Enter your e-mail address. “User Name”: Enter your e-mail address, again. “Password”: Enter the password you set up for your e-mail account. 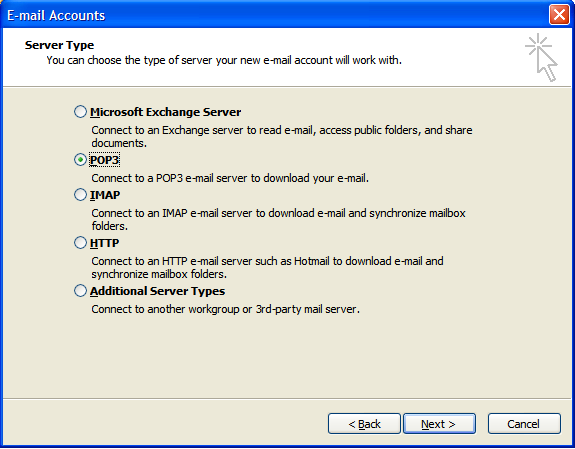 “Incoming mail server (POP3)”: Enter mail.tempesttech.com for your incoming mail server. “Outgoing mail server (SMTP)”: Enter mail.tempesttech.com for your outgoing mail server. Step 5: In the Internet E-mail Settings window, select the “Outgoing Server” tab. 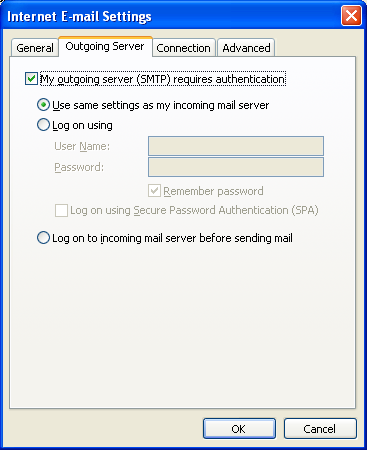 Step 6: Select “My outgoing server (SMTP) requires authentication”. 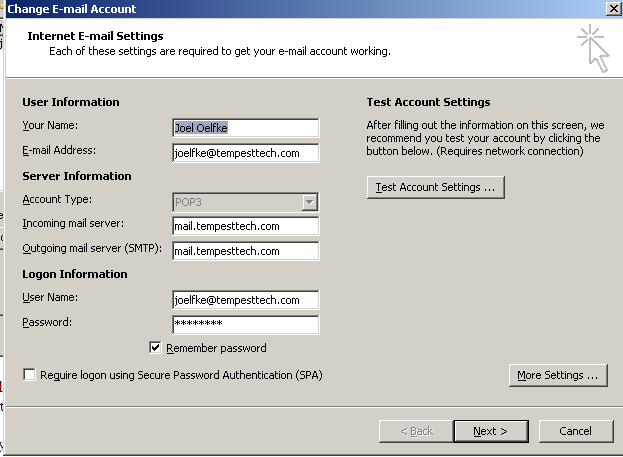 Step 7: If you did not change the SMTP relay section, select “Use same settings as my incoming mail server”. If you changed the user name and password in the SMTP relay section of your Manage Email Accounts page, select “Log on using” and enter the user name and password. The following example assumes you did not change your SMTP relay section in your Manage Email Accounts page. 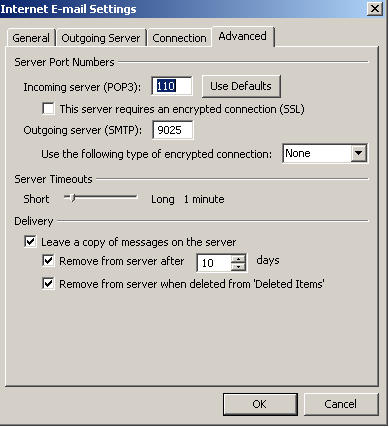 Step 8: Select the “Advanced” tab and change the “Outgoing server (SMTP)” port to 9025.